Three kilometers of Canmore trails, three breathtaking bridges, and a stunning tree-lined boardwalk. Connects the Spring Creek neighborhood to downtown Canmore, and the endless trails Canmore has to offer. Exploration surrounds us! The number and quality of our connections to the town have made Spring Creek popular as a “commuter trial” for cyclists and pedestrians on the move between downtown Canmore are neighbourhoods on the east side of town. Many Canmore kids follow our trails to and from school, and folks who work downtown often find lunchtime sunshine and exercise along with our neighbourhood boardwalk and pathways. Local events are also making the most of Spring Creek’s connectedness– like the Plaid Goat Mountain Bike Fest (plaidgoat.ca), whose event in 2017 made use of Spring Creek trails. 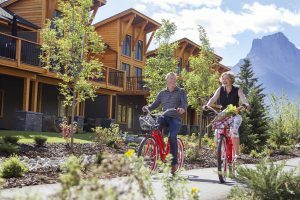 Through the Spring Creek Community Bikes program, our homeowners and guests can pedal around the heart of Canmore to their hearts’ content. We have eight fantastic townie-style bikes they can borrow to run errands, grab lunch or just cruise around town. For ease, comfort and practicality, each bike has a height-adjustable seat and comes with a basket, helmet and combination lock. Spring Creek is proud to be one of the progressive businesses that belong to the Town of Canmore’s “Bike Friendly Business” program. Biking is a big part of Canmore’s culture. The Bicycle Friendly Business program showcases bicycle-friendly businesses and their efforts to enhance the biking experience in Canmore for residents and visitors and increase awareness about the positive social, cultural, economic and environmental benefits of cycling. Our commitment to creating a bike-friendly community is evidenced in our paved pathways, pedestrian bridges, bike maintenance station, bike racks throughout the property, public washrooms and neighborhood townie bikes. You can learn more about it at bikecanmore.ca/bikefriendly. In fall 2017, Spring Creek and the Town of Canmore put the wraps on a road improvement project aimed at improving the connection between downtown, Spring Creek and the rest of the town. To maximize the efficiency and minimize the costs of the infrastructure improvement project at the intersection of Main Street and Spring Creek Drive, the Town of Canmore synchronized its road construction program with Spring Creek’s. In keeping with the many different ways people get around our town, the $4.3 million road reconstruction and deep utility project weren’t all about the vehicle. The plan carefully considered – and addressed – how people in the community get around, contributing in a transportation network that increasingly accommodates more than cars and trucks by creating space for pedestrians and cyclists. The redesigned section of Main Street includes a shared pathway for pedestrians and cyclists, with cyclist space identified and separated with red-colored asphalt. By improving traffic flow and helping to reduce vehicular traffic by making Canmore’s streets more bike and pedestrian friendly, the infrastructure improvement will also help to ease traffic congestion. Read more about it at canmore.ca/projects/spring-creek-drive.